"In some ways they are mocking the EC"
Opera CEO Jon von Tetzchner has slammed Microsoft's statement that they will ship a Windows 7 version without Internet Explorer insisting that the company is 'playing a game' with the EC. "They are trying to play a game," said von Tetzchner, "and I don't think anyone appreciates that fact they are trying to get away with a solution that doesn't solve anything. "Microsoft is proposing a solution that is not going to solve the issue or provide consumers with choice," he added. "The point is that you are giving the OEMs a choice – will you ship with Internet Explorer or without? And if you do not then you run the risk of alienating [Microsoft]. "In some ways they are mocking the Commission, by offering a solution that they know doesn't solve anything." 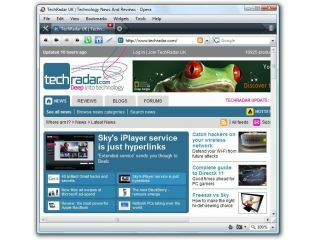 Von Tetzchner believes that the EC are settling on a list of available browsers - or 'Ballot Page' - that will allow new Windows 7 users to choose their browser from a list, and he accuses Microsoft of running scared from this option. "My impression is that the Ballot Screen is the EC's preferred solution and that this will work. "Microsoft understands that this solution will work and they are desperate to avoid it. "We expect to see a solution that actually solves the problem, namely that Microsoft have been benefiting from violating the law for 13 years." Von Tetzchner also responded to the growing weight of people who feel that Microsoft are getting a rough deal, insisting that the importance of consumer choice is paramount - and that the recent financial collapse is proof positive of this. "Not everyone understands competition law, just like not everyone understood financial regulations, but in the latter case most people understand that better financial regulations might have stopped us getting into the position we are in now. "I want to reiterate that we are NOT saying that Microsoft should unbundle IE from Windows – we have never wanted this – we just want people to have the choice of multiple browsers." The Opera chief also had a question for Microsoft, who have previously insisted that internet connectivity is vital to the OS. "It wasn't long ago that Microsoft said taking out Internet Explorer would cripple Windows, but now they say that they can do it. So is this version they are offering crippled?" In the interests of balance, Microsoft has a full explanation of its stance on its legal blog - insisting that it is 'working to fulfil its legal obligations'. "Given the pending legal proceeding, we've decided that instead of including Internet Explorer in Windows 7 in Europe, we will offer it separately and on an easy-to-install basis to both computer manufacturers and users," says the software giant. "Windows 7 will be offered in Europe in all of the versions that will be available here in the United States, both 32- and 64-bit, with an "E" at the end of the product name (for instance, Windows 7 Home Premium E). "The E versions of Windows 7 will ship at the same time as Windows 7 ships in the rest of the world, and they will be available in 23 European languages. "What does this mean for European consumers? The E versions of Windows 7 will include all the features and functionality of Windows 7 in the rest of the world, other than browsing with Internet Explorer. "Computer manufacturers will be able to add any browser they want to their Windows 7 machines, including Internet Explorer, so European consumers who purchase new PCs will be able to access the internet without any problem. Consumers will also be able to add any web browser to their PCs, to supplement or replace the browsers preinstalled by their computer manufacturer."